Covered storm porch, Upvc double glazed door to entrance hall. Stairs rising to first floor, part glazed door to Sitting Room. White suite of wall mounted wash hand basin, low level w.c, Upvc double glazed window to front aspect, radiator. 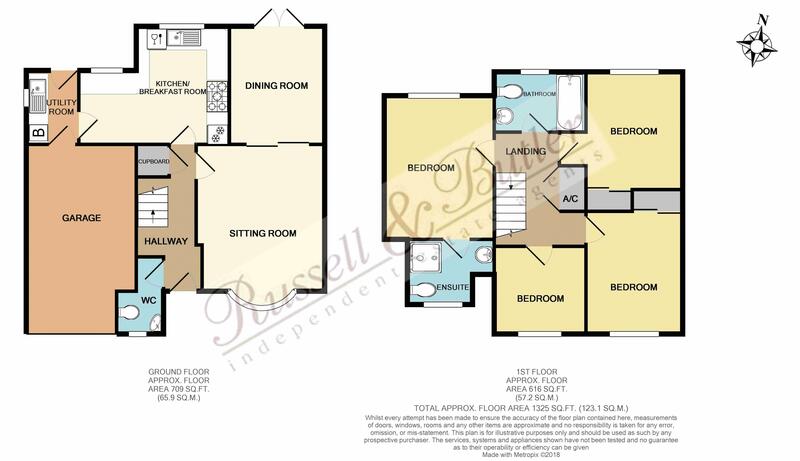 Wood flooring, coving to ceiling, Upvc double glazed French doors to patio and rear garden. Inset single drainer stainless steel sink unit with mono block mixer tap and cupboard under, ceramic tiling to splash areas, space and plumbing for washing machine, cupboard housing 'Potterton' gas fired boiler serving both domestic hot water and radiator central heating, Upvc double glazed door to side. Access to loft space, double width airing cupboard housing hot water tank. Upvc double glazed window to rear aspect, radiator, door to utility room. Coloured suite of shower cubicle with shower as fitted, low level w/c, pedestal wash hand basin, ceramic tiling to water sensitive areas, Upvc double glazed window to front aspect. Built in double width wardrobe, Upvc double glazed window to rear aspect, radiator. Built in double width wardrobe, Upvc double glazed window to front aspect, radiator. White suite of panel bath with separate shower over, pedestal wash hand basin, low level w/c, full height ceramic tiling to walls, Upvc double glazed window to rear aspect. Block paved driveway providing off road parking for several vehicles, lawn area, single garage. Single garage with up and over door, light and power connected, personal door to Utility Room. Laid mainly to lawn with flower and shrub beds and borders, paved patio, fully enclosed by panel fencing and brick wall, outside tap. All main services are connected. EPC Rating D.